I’m not a huge fan of saying there are “rules” in using social media, but “guideline of thirds” sounds a bit silly. 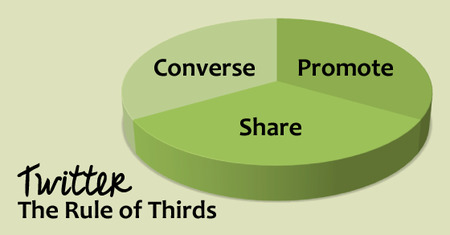 We encourage the Twitter rule of thirds because it’s easy to remember - we’re all about keepin’ it simple. Here’s the thing: there are three important things you will want to do if you want to grow a community through Twitter. These three things are listed in the priority order but 3 (promote) should never be more than a third of your total tweets. Social is the most important word in “social media”. Be personable. Do a little networking. Jump in to conversations. Every one of these suggestions is the right way to use Twitter - even if it goes against the IRL (in real life) manners that are ingrained in you. Don’t let that stop you from getting the most you can out of using Twitter. You can have five different conversations going on at once if you want. You can answer right away or two days later. Conversation on Twitter is more flexible than conversation you’ll find in any other forum. 2) Share other people’s content. You are one of millions and millions of really smart people using Twitter to share really smart content. I bet your audience will find value in things that aren’t written by you - the same way you find it valuable. So, why not share it? It can even be content from a competitor. Or, rather, someone else who has a similar business. We share valuable content from other consultants all the time. 3) Promote your own content. You’re working hard to build great content that’s useful to others, so promoting it is the best way for you to help the right people find it. Don’t be shy about sharing your original content. You just don’t want that to be the only thing you do. The Twitter rule of thirds will help you stay cognizant of how much you’re networking, sharing and promoting and that you’re using Twitter to its full potential - to build relationships. What personal guidelines do you have for using Twitter? I’m driving a different car these days. My borrowed car is low tech and forces me to listen to the radio *gasp* if I want to listen to anything on my commute. I’m used to plugging in my iPod and listening to what I want, when I want. I can rewind, fast forward and skip around to my little heart’s content. But in rediscovering the radio, I’m practicing my listening and observing skills in a different way. The funny thing is that old media meets new media in a really interesting way because the radio reminds me so much of Twitter! Some stations (accounts) run promotions - whether it’s their content or advertising from other businesses. It’s balanced sharing, too - human interest stories, community events, news, and all sorts of other really great content that the audience might find interesting or - even better - want to hear and know about. I think what I like best about listening to radio is hearing really creative commercials. There’s the usual car dealership commercials that sound the same as they’ve sounded my entire life, but other businesses are getting really creative and clever. It worked, too! I was interested in going to a couple of businesses I hadn’t previously even heard of. Radio is a finite interaction. Lara has used this analogy of “Twitter is like a radio” for a long time. It helps newer users understand that they don’t have to read every tweet sent when they weren’t logged in and it’s true. 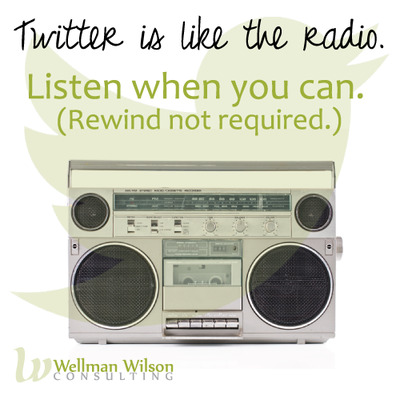 Radio doesn’t allow you to pause, fast forward, or rewind - a lot like Twitter. However, there’s a difference with interactions. Radio is primarily one-sided and finite. You turn it off and you can’t go back and listen to what you’ve missed later. Twitter allows you to come and go, picking up the thread of conversations as you have time. BUT you don’t have to read through everything that everyone you’re following has said while you’re logged out. And thank goodness for that, because that would be incredibly overwhelming. The bottom line is that old media and new media influence each other. You can find inspiration from one that can be used successfully with the other. The most important thing is to evolve and be creative. Find unique ways to grab your audience’s attention. Jump in, interrupt, bite the bullet and chat with me! Image Source: MorguefileI was having lunch with my friend, Kim, yesterday. She came to Ottawa ALL the way from Winnipeg to attend Social Capital Conference last weekend. (How cool is that?) We got to chatting about Twitter, because we often do since that’s where we met. Kim made an observation about some twitter users that I’ve noticed as well: when “butting in” to a conversation, many preface their comments with an apology for doing so. I’ve done it before, too. I’ll likely do it again without thinking. It’s hard to reverse the social rules we’ve been brought up to respect. When conversing face-to-face, interrupting is a no-no (and I am guilty of that one, too). However, Twitter etiquette gives us greater leeway. That’s one of the reasons I like the “semi-private” nature of tweets. By that, I mean that if Lara and I are having a public conversation, anyone who follows both of us can see the conversation in their timeline. However, if someone is only following one of us (it happens), they won’t see the conversation, even though our tweets are public. I really like that this gives the opportunity to jump in to conversations between other people. In fact, “interrupting” is not only acceptable, it’s a great way to get to know new people - and it’s encouraged! Lara has written about the networking event that is Twitter before. 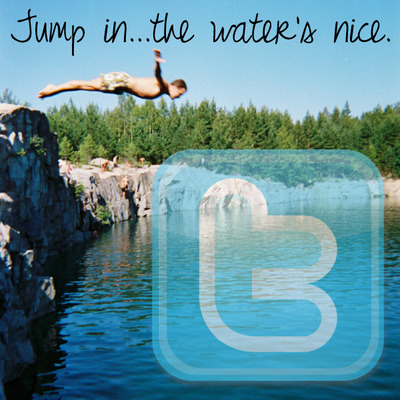 The value of networking on Twitter is in jumping in to conversations! So, be brave and jump in without apology. It really is unnecessary. Lara likes to call Twitter a big networking event. I like to call it the world’s biggest chat room and 17 years ago when I entered my first chat room, I jumped right in to the conversation. You can too and I promise you’ll be glad you did. Yes, even business owners - provided you’re being social on the networks you use. (Please be social…we can talk about that another day, though.) We have some case studies we’ll be sharing over the next few months that will show you how beneficial the social aspect of social media can be to your bottom line. So, please jump in, interrupt, bite the bullet and chat with people…including me and Lara! Unless you’ve been living under a rock lately, you’ve probably heard of the Internet. In fact, you’ve probably used it to find recipes, read reviews on upcoming movies or to find out whether your favourite restaurant is open or not. It’s pretty safe to say that most of us use the Internet today as our main source of gathering information. Along with Internet use comes social media networks like Facebook, Pinterest, Twitter and Instagram. All of which are great ways of sharing information with our families and friends about what we like and don’t like. One of the reasons people hesitate when considering using social media for business is because they think that when they open themselves up to comments and critiques from the public, they will face a backlash of negative reviews and criticisms about their business and products. The fact is, however, that the conversation is already happening. Especially if you’re a big company with a recognizable brand. The reality is that even if you decide not to use social media as a way of promoting your business, you aren’t protecting your brand by staying offline, you’re losing out on being a part of the conversation. Social media can be a great way to reach out and communicate with your customer base about what they need and how you are doing in meeting those needs. Social media is also a great way to reach out and solve any customer service issues, showing your customers and the world that you are responsive and caring. It’s a way to let your expertise shine through. Let’s use a high school analogy. In high school, some people talk behind your back but smile to your face. Social media is like that friend in school who always has your back. They’ll tell you what people are saying about you and help you deal with the fall-out, either positive or negative, from the conversations going on about you. Don’t get left out of the Conversation. If you’re having some difficulties getting your social media conversation going, we’d love to help you take those first steps!